HSV business partner Mobil, entertained the Victorian branch of the HSV Owners Club with a special promotion at their August meeting. The Mobil 1 ‘Mobiliser’ – one of only 35 operating anywhere in the world - is the ultimate simulation experience, capturing the physics of real racing and delivering forces a driver feels during real race conditions; being pushed back into the seat when accelerating, pulled hard against the seatbelts when braking and straining against the side forces when cornering. 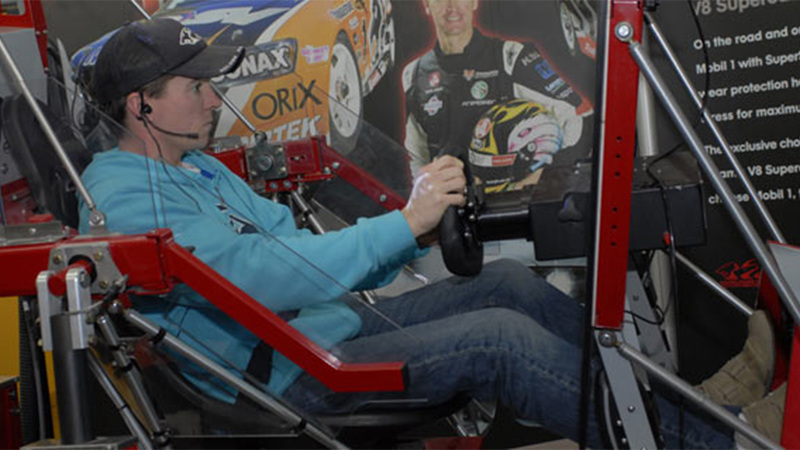 Ryan was one of a handful of lucky members who were able to experience what it is like to hurtle around in a simulated V8 Supercar, like the Holden Racing Team’s Mark Skaife or Toll HSV Dealer Team’s Rick Kelly. In V8 Supercar mode, the Mobiliser recreates the driving experience around the Northern Terriory’s Hidden Valley racetrack. Alternatively participants can drive the simulator in Formula 1 or rally car modes. Prior to the simulator beginning its performance, Chris Knight from Mobil gave an insightful presentation on the benefits of Mobil 1 synthetic lubricant, explaining how racetrack technology contributed to the development of the world’s best engine lubricant. Not surprisingly, when Chris asked the crowd how many of them used Mobil 1 in their own HSV’s, very few hands remained down! HSV owners know how important it is to keep their vehicles – and particularly their engines – in tip top condition. Mobil1 goes a long way toward achieving a cleaner, better performing HSV engine. Special thanks to Victorian Owners Club President, Colin Pocock, pictured with Chris Knight from Mobil, for facilitating the evening.